Become a NAADAC Corporate Sponsor and identify your business or organization as a recognized partner and supporter of the 100,000 addiction professionals that NAADAC, the Association for Addiction Professionals, represents. The NAADAC Corporate Sponsorship Program not only provides your business or organization with a direct relationship with NAADAC, but also with its constituents and the addiction treatment community. 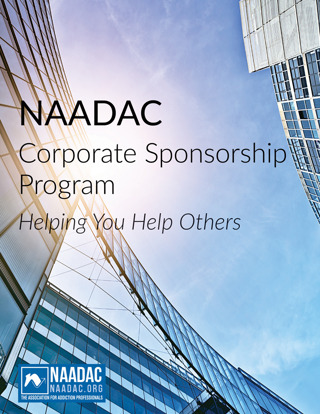 Solidify your business or organization’s leadership in addiction prevention, treatment, and recovery, and become a NAADAC Corporate Sponsor today. With over 10,000 members, 210,000 website page views per month, 48,000+ active email addresses of professionals across the country, and a national magazine with readership of over 11,500, NAADAC can provide your organization with increased visibility. Sponsor advertisement on all NAADAC website pages to run for one year (365 days) in rotation with other corporate and annual conference sponsors. News release announcing sponsorship posted on NAADAC website, which receives over 210,000 page views per month. Special listing with logo, website, and description on NAADAC Corporate Sponsors webpage. Certificate to publicize your sponsorship. Subscription to quarterly NAADAC magazine, Advances in Addiction & Recovery. Free two full page color advertisement in quarterly NAADAC magazine, Advances in Addiction & Recovery ($5,740 value). 50% discount on Addiction & Recovery eNews (circulation of 48,000+) (a value of up to $300 per advertisement). Ability to use NAADAC Corporate Sponsor Logo on sponsor website, marketing, and communication channels. Discount on NAADAC Approved Education Provider application. 20% discount on individual memberships for your employees. One free corner exhibit booth space at NAADAC Conferences ($2,000 value). 5 complimentary full NAADAC Annual Conference registrations. 1 free full page interior advertisement in the NAADAC Annual Conference Program ($1,200 value). Tote Bag Insert at NAADAC Annual Conference ($2,000 value). Annual Conference recognition during the opening Keynote session and President’s Awards Luncheon. Co-sponsorship with other Diamond and Platinum Sponsors of the biggest conference event, the President’s Awards Luncheon. Access to conference attendee list with contact information emailed two weeks pre- and post-conference to sponsor ($1,000 value). Free one full page color advertisement in quarterly NAADAC magazine, Advances in Addiction & Recovery ($2,870 value). 40% discount on Addiction & Recovery eNews (circulation of 48,000+) (a value of up to $240 per advertisement). One free inline exhibit booth space at NAADAC Conferences ($1,500 value). 4 complimentary full NAADAC Annual Conference registrations. 1 free 1/2 page interior advertisement in the NAADAC Annual Conference Program ($900 value). Free one half page color advertisement in quarterly NAADAC magazine, Advances in Addiction & Recovery ($2,120 value). Optional subscriptions to NAADAC's two eNewsletters, the weekly Professional eUpdate and biweekly Addiction & Recovery eNews. 30% discount on Addiction & Recovery eNews (circulation of 48,000+) (a value of up to $180 per advertisement). 30% discount on booth space at NAADAC Conferences (a value of up to $600 per booth). 3 complimentary full NAADAC Annual Conference registrations. 30% discount on NAADAC Annual Conference Program interior advertisement (a value of up to $360 per advertisement). 25% discount on Addiction & Recovery eNews (circulation of 48,000+) (a value of up to $150 per advertisement). 25% discount on booth space at NAADAC Conferences (a value of up to $500 per booth). 2 complimentary full NAADAC Annual Conference registrations. 25% discount on NAADAC Annual Conference Program interior advertisement (a value of up to $300 per advertisement). 15% discount on Addiction & Recovery eNews (circulation of 48,000+) (a value of up to $90 per advertisement). 15% discount on booth space at NAADAC Conferences (a value of up to $300 per booth). 1 complimentary full NAADAC Annual Conference registration. 15% discount on NAADAC Annual Conference Program interior advertisement (a value of up to $180 per advertisement). For more information or to submit a proposal, please contact NAADAC’s Director of Opertions and Finance, HeidiAnne Werner at hwerner@naadac.org or call 703.741.7686 x101.